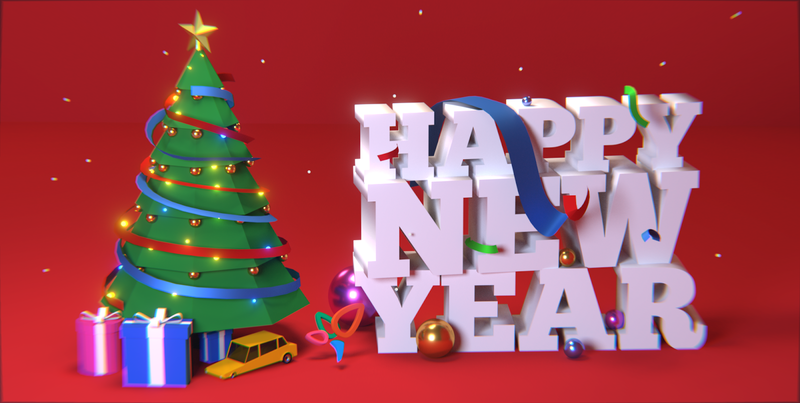 2018 has passed and we are thrilled to look back at the most important enhancements that have been made and reached. Please, be advised that on October, 15th eMagicOne will be providing limited support. Phone support and live chat will be unavailable. We will be back in full force and ready to help you on Tuesday, October 16th, when usual support hours resume. During this period you will still have full access to your licenses. It’s perfect time for you to save big on the best VirtueMart extensions developed by eMagicOne. eMagicOne loves you and we all work hard to make you happy. We develop our VirtueMart extensions with care and do our best to make your lives easier with our software. If you did not have the chance to experience this, give a try to our VirtueMart solutions and you will definitely fall in love with them! Don’t wait for cupid’s arrow, get perfect extensions that match for your VirtueMart store this Valentine’s Day. Store Manager for VirtueMart - to manage your store easier than ever before and be one step ahead of competitors. QuickBooks Integration - to ease accounting syncing between VirtueMart and QuickBooks with a few clicks. So treat your yourself! Because eMagicOne software will be a perfect Valentine for your VirtueMart. The number of coupons is limited. The availability of codes one can check on our website https://www.opencartmanager.com/order. A bunch of new features and improvements have been implemented into the new version of Store Manager’s Amazon Integration Addon. Find out new possibilities of VirtueMart to Amazon integration and take advantage of the increased functionality of the module. Enhanced version of Amazon Integration addon (v.1.0.0.252) is compatible with Store Manager for VirtueMart starting from version 1.11.0.879. In order to update the module, you have to update Store Manager first. Set shipping methods in the process of products synchronization. Now mapping will be based on the values priority and availability and all the fields to be mapped can be selected at one stroke. Besides, newly added items to product listings can be automatically assigned to the existing ones. You can use category search filter (either when adding new products to listings) and view the list of suggested categories. You can choose from what field to export product quantity. Besides, it can be exported to specific rules. From now on Amazon Integration module requires its users to log into it by inputting MWS (Marketplace Web Service) AuthToken. This token is used to give the developer access to your account (for example, make the account accessible for eMagicOne). Read more on how to get an MWS AuthToken here. Find the full list of improvements here. Try the renewed version of VirtueMart to Amazon Integration module and take advantage of the wide arsenal of instruments now! New Beta version of Amazon Integration is available for VirtueMart store owners! 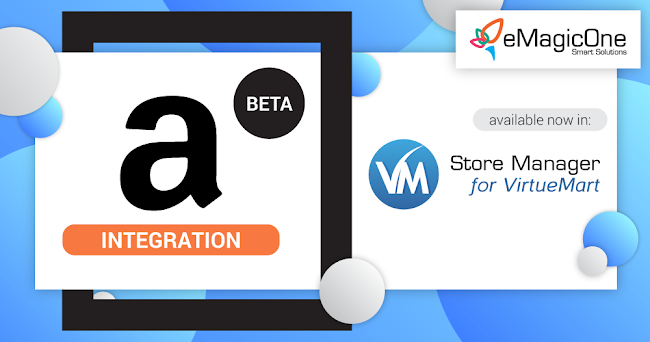 eMagicOne team is glad to share new Amazon Integration Beta version (0.9.2.233) for Store Manager for VirtueMart! Integrate your VirtueMart store with one of the worlds largest and most popular selling channels with ease, exporting and synchronizing product listings and arranging orders with no efforts. Shipping support has been implemented in current BETA version of Amazon Integration. Now, Settings tab allows to establish shipping methods when synchronizing products. Now, category list can be filtered when adding products to listing. Confirmation message has been added when deleting the account. Mapping products process has been improved with possibility to select all fields for association at one time. Also, mapping will take place according to the priority and availability of value in this field. When adding products to listing, they can be automatically mapped to the existing ones on Amazon Marketplace. There were visual changes made in plugin interface. Inventory tab grid has been expanded with an option that allows to show calculated product price and quantity that will be synchronized with Amazon. Suggested categories list selection has been fixed in current version of the addon. "Details" link for listing logs has been enhanced. Now, it is shown for listings with all statuses, except for those, that have "Submitted" status. Previously, when deleting operation logs, not all related tables data was removed. The issue has been fixed. Status of listings that have just been synchronized is now displayed properly. 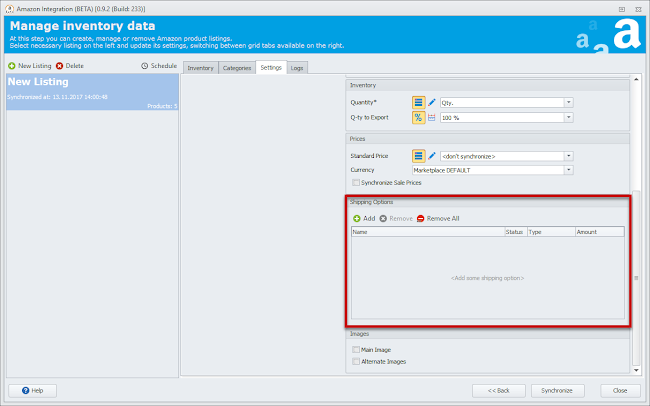 An error that occured while checking formulas for prices set by the user has been fixed. Now, the regional parameters are correctly considered. Before the update of the addon, we recommend you to backup all Amazon Integration files to some local folder in case you want to roll back to older version of the addon. You can check the list of the details that need to be saved following this article. Go to Raw Table Editor section accessible in Tools section of Store Manager. Filter the tables related to Amazon addon among all the available ones. Highlight the filtered tables and launch to Script to Clipboard/Drop option in the context menu. 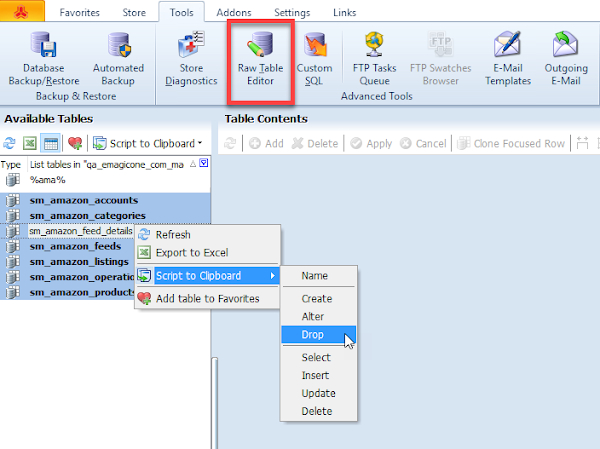 After that, proceed to Custom SQL tab, paste the tables and press Execute SQL button. Close Store Manager and copy the previously saved old AmazonIntegration.dll file you have been using to C:\%ProgramFiles%\eMagicOne\Store Manager for VirtueMart\Plugins\. Load previously saved settings to the Amazon Integration.Load previously saved settings to the Amazon Integration. Once all the backups are saved, you may proceed with Amazon Integration Beta installation using this link - Download VirtueMart Amazon Integration addon. Current Amazon Integration Beta version is compatible with Store Manager starting from version 1.11.0.879. If you are using older version of Store Manager, than it is specified and want to update Amazon addon to the version 0.9.2.233, you have to update the application first. 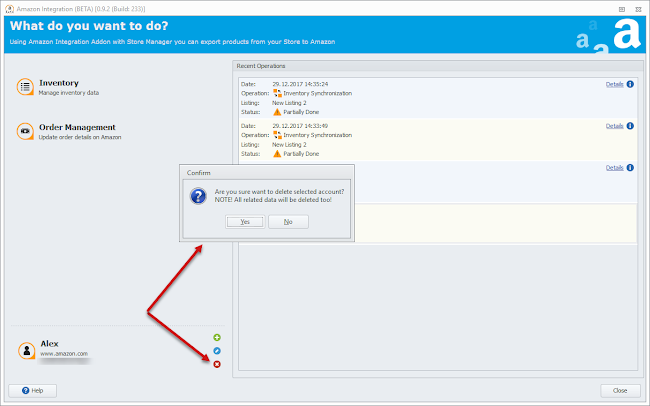 *Amazon Integration is already built in Store Manager software and cannot be used without it. 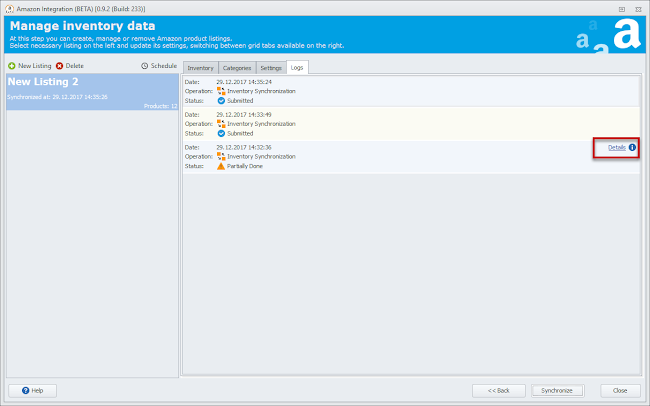 If you do not have Store Manager, try Trial version of the application and check all the possibilities of the addon and other functionality Store Manager offers.